that tell our body that something fishy is going down. There is a campaign sponsored by NYC’s Metropolitan Transit Authority (MTA) encouraging citizens to speak up if they see any activity or persons acting in a suspicious manner. Plastered all over buses, subways, and commuter rails are posters with the following message: If you see something, say something. This type of imagery reminds me very much of our own biological warning system programmed to, in essence, “speak up” should a suspicious character of the microscopic kind make it’s way into our bodies. It is through our immune response that our bodies “say something” in the event of infection. At the very crux of the immune response are tiny proteins called antibodies, which are basically like the citizens that report any suspicious activities. Antibodies often travel in the blood stream, and upon crossing paths with a foreign invader (bacteria, virus, etc. ), an antibody will flag it down and alert the “local authorities” of the body (aka immune cells). For many years, scientists have been studying antibodies and their role in the immune response, revealing many aspects surrounding their structure and function. And through these studies, we have figured out how to use antibodies in ways that go beyond the immune system. For instance, antibodies against human chorionic growth hormone, or hCG, are the essential ingredients in home pregnancy tests. More recently, scientists have, in many ways, harnessed the power of antibodies for pharmaceutical uses. A very popular example of this is the drug Remicade, which is used to treat severe autoimmune diseases like rheumatoid arthritis and Crohn’s Disease. But, what exactly are antibodies and how do they work? Well, I am glad I asked me that question. As I mentioned, antibodies are proteins that we make. Specifically, they are produced by specialized immune cells called B-cells, which are the main players during our humoral immune response. B-cells will either secrete an antibody, which can then float around the circulatory system, or the antibody can remain attached to the outside of the B-cell. If there is something “foreign” in our bodies, such as a virus or bacterium, antibodies will recognize and attach itself to the invader, which is scientifically referred to as an antigen. When an antibody attaches to an antigen, it signals to our body to get rid of it. Amazingly, each antibody can only recognize 1 antigen, which is why we need so many different types of antibodies! To get a better idea of how antibodies work, it is important to learn their basic structure. Antibodies are ‘Y’ shaped proteins, and have both constant and variable regions. 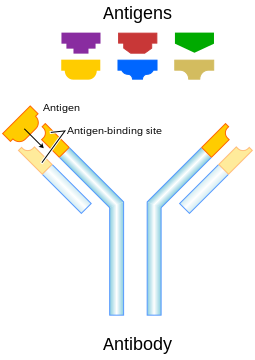 The constant region is the same among all antibodies within a specific class (there are several different classes), where as the variable region is the portion of the antibody that is designed to recognize a specific antigen. A basic analology for how antibodies work. Building off our understanding of how antibodies work, scientists have been able to develop monoclonal antibody therapy, which is the use of specific antibodies to stimulate an immune response against a disease. For instance, we now use monoclonal antibody therapy to combat a variety of cancers by injecting cancer patients with antibodies designed to recognize specific components on the surface of tumor cells. This helps signal to the body that it should turn on the immune response and get rid of the tumor cells. The list of conditions where monoclonal antibody is a potential therapy is growing, and includes a variety of autoimmune diseases and cancers, post-organ transplant therapy, human respiratory syncytial virus (RSV) infections in children, and most recently hemophilia A. Also being explored is the use of monoclonal antibody therapy for addiction, which could essentially revolutionize how we can help people kick extremely difficult habits (i.e. cocaine or methamphetamine). Despite the thousands of tedious and repetitive assays I’ve done using antibodies in my own laboratory, I know that I can never lose sight of how amazing these little proteins are. This post is a mental appetizer for another post on monoclonal antibodies by DXS tech editor, Jeffrey Perkel. His post specifically discusses the potential use of monoclonal antibody to treat the X-linked blood disorder, hemophilia A. Read about it here.